This is the full text and images from the manual. This may take 3 full minutes for all images to appear. If they do not all appear. Try clicking the browser "refresh" or "reload button" or right click on the image, choose "view image" then go back. It should now appear. Most other places would charge you $7.50 for a electronic copy or $18.00 for a hard to read Xerox copy. This will allow me to continue to buy new manuals and pay their shipping costs. It'll make you feel better, won't it? to 1 /1000 sec. plus B; shutter lock and "Cocked" indicator. M and Refconverter M fit the viewfinder frame. Ratchet-type rapid wind lever, plastic-tipped for winding comfort. film wind and shutter cocking. Back MX, Dial Data MX for data recording on film. 135.5mm x 82.5mm x 49.5mm. 1. Remove the rear lens and body caps. lens into the body and turn it clockwise until the lens locks with a click. lever while turning the lens counterclockwise with your right hand. without the rear lens cap, place place it frontelement down never front element up. the battery chamber before operating the camera. Eveready S76E or Mallory MS76H or equivalent. will turn red, showing that the shutter is cocked. sec. outdoors in daylight and 1/30 sec. indoors. comes into sharp focus and choose the most pleasing composition. "250" in the case of "125") are visible on the right-hand side of the viewfinder. matter how far you turn the aperture ring, change the shutter speed. rewind knob until the back opens. surrounding the film take-up spool. counter turns to "1 ", indicating that the first picture is ready to be taken. number of your film is aligned with the index mark. X setting on the shutter speed dial, refer to page 18.
setting, set the shutter button lock by moving the lever to the left (an "L"
release with a locking device for a time exposure. trip the shutter before putting the camera away for any extended period. in the microprism collar will appear broken into many small fragments. get a proper LED exposure read-out in the viewfinder. transparent disk which protrudes slightly into the focusing screen area. blurred pictures are due to camera movement. automatically), and remove the film cartridge. a shoe mount electronic flash. It remains "cold"
its cord plugged into the X terminal on the body front. This eliminates the danger of electric shocks. the hot shoe and the bracket types are attached via the tripod socket. proper terminal. When not using the terminals, keep the plugs inserted. depth of field also changes. For the depths of field at different apertures and distances, refer to the next page. 1. As exposure measurements made at 1/1000 sec. with 25 ASA film will not be accurate, exercise caution. above table can be guaranteed only when using up to f/16 (f/1.4 - f/16). example - you make the aperture 1 or 2 stops smaller to compensate. desired by turning the aperture ring. Then adjust the shutter speed dial until the green LED illuminates. until the green LED illuminates. prevent accidental release of the shutter. exposure meter; the shutter mechanism is a totally manual operation. correct exposure in a variety of situations. immediately release the shutter without delayed action. lever 90° -180°. Then, push the start button, and the Selftimer will commence. with an orange line on the depth-of-field scale. by turning the focusing ring accordingly. For instance, if your subject is in focus at infinity, turn the focusing ring and move the infinity (00) mark to the infrared mark. NOTE: An infra-red focusing adjustment is not required when working with infra-red color film. For deliberate multiple exposures, make the first exposure in the normal way. the shutter is cocked, a double exposure will be counted as two frames. the like, but just use a blower. automatic diaphragm will not function. 2. Full-aperture metering lenses will function as stopdown metering lenses. Takumar lenses can then be attached in the normal way. feel it release, and take it out. camera body plays no part at all. metering system must be used. The temperature range at which your camera will continue to function properly stretches from 50°C to -20°C. sub-freezing one, and if tiny drops of moisture freeze, further damage may be done by their expansion. camera in its case or bag will help somewhat in minimizing the effects of a rapid temperature change. is effective; but be sure to wipe away all moisture completely. Commercial lens cleaners are also effective. Minor dirt or spots on the mirror will not affect the clarity of your pictures. handling can easily damage the internal mechanism, even though externally nothing seems to have been hurt. 4. Your camera is not waterproof. There are several places where water can get inside and do a great deal of damage. your camera should get wet, dry it off immediately with a clean, soft cloth. Once a camera has become completely soaked, there is often nothing that can be done to make it right again. 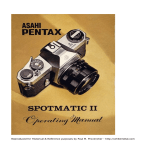 However, in such a case, take your camera as soon as possible to an authorized Asahi Pentax Service Center. camera will not function properly. whether expressed or implied, is strictly limited to the replacement of parts as hereinbefore provided. instruct the service station to proceed with the servicing. please refer to the separate Warranty Policy Card enclosed here.